Builder of the House are a duo hailing from the indie haven of Portland, OR. Formed in 2011 by Rob Cimitile with partner Eliot Heeschen; both doing heavy lifting in bands prior to coming together. 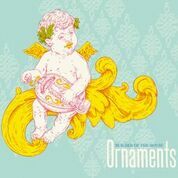 Builder of the House has steadily made a name for themselves through incessant touring leading up to the release their first full length album; Ornaments. The band has fused indie pop with a groove laden folk music that begs listeners to get up and dance. The album tends to flip a switch from Appalachian style barn stompers, to Latin tinged movements disguised behind Cimitile’s fragile voice. Lead song “Never Going Back Again” is a boot stompin’ singalong, with good harmony between Cimitile and Heeschen.”When No One is Here” brings a slow building drum beat with vocals wrapped around until the end when all is unleashed. “Look at the Man” is a delicate, radio-ready love song. “Pray For Me” is a loose, western-tinged jam ripe for a shootout. “Weight in Gold” comes straight from a barn party with the whole family joining in. Builder of the House writes really good, really smooth music. I feel though, unfortunately for the band, the brand of music they play at the moment has been hot for some time. I like the record… a lot, but the folky, Americana style of many bands has been saturated as of late, no matter how good the record. With that being said, the cream rises to the top, and Ornaments should be towards the top.